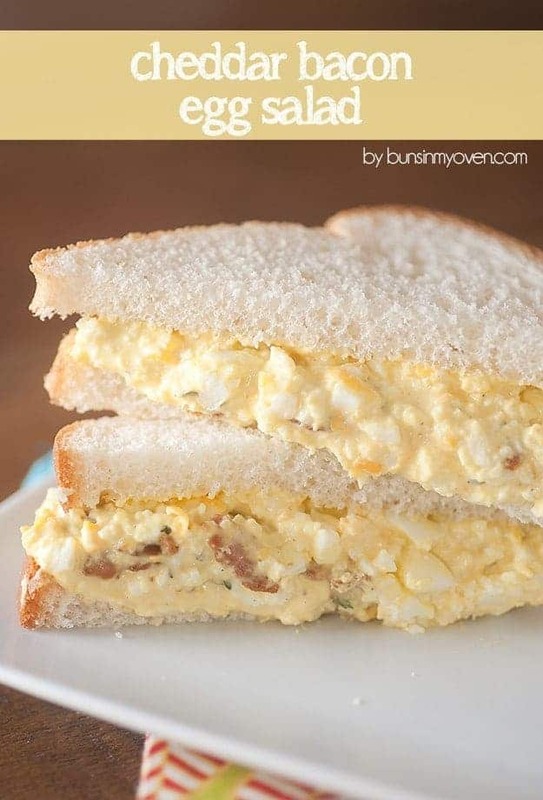 How To Make Egg Salad - my recipe is loaded with bacon and cheddar! This is the best egg salad recipe ever and I think you’re going to love it! It’s loaded with bacon and cheddar! Well, we moved. From Illinois to Nebraska. Aaaaand, I’m officially living in the middle of nowhere, you guys. Do you know what this means? Do you? It means that I must prepare myself. For what, you ask? Well, for all the things. 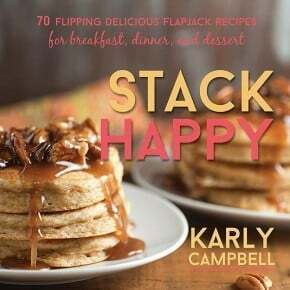 For breakfasts, lunches, and dinners, most importantly. In the past, we were really bad about hitting up the drive thru for lunch. Not every day, but a few times a week, at least. It was quick, it was easy, it was cheap. Also, cooking three meals a day is just too much. For serious. 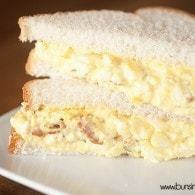 My egg salad sandwich recipe has saved me at lunch time on more than one occasion! My kids are homeschooled, which is lovely, but it also means that I am responsible for every meal, every day. It can get to be a bit much. Also, I don’t want to be the weirdo that admits to loving fast food, but…I kind of love fast food. Those french fries get me every time. I don’t even hate the burgers. I know. It’s totally unpopular to admit that, but I gotta be me. Do you have a love for fast food too? Say we’re still friends. Check out how to make egg salad exciting. Hint: It’s with cheese and bacon. Now that I’m in Middle of Nowhere, Nebraska? I’m cooking three meals a day. 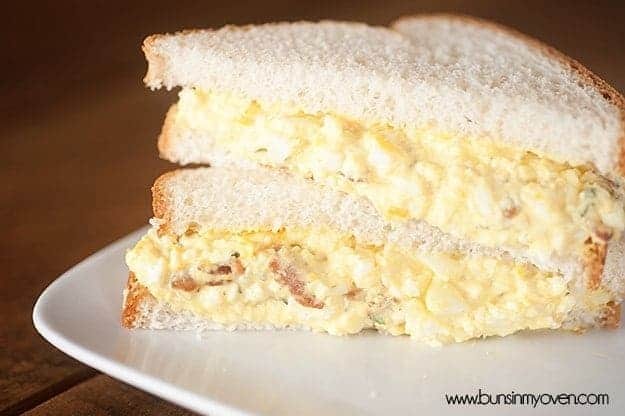 Lucky me, this egg salad sandwich recipe is not only easy, but tastes phenomenal. It’s full of flavor from the bacon and cheddar, perfectly creamy from the hit of mayonnaise, and has just the right bite from the mustard. I even ate this for breakfast today, which was not weird, because it’s basically bacon, eggs, and toast. Winning! And when I say that we’re eating this allllll the time, I’m not kidding. We went through FIFTY-SIX EGGS in the first 10 days of living here. That is a lot of dang eggs, my friends. 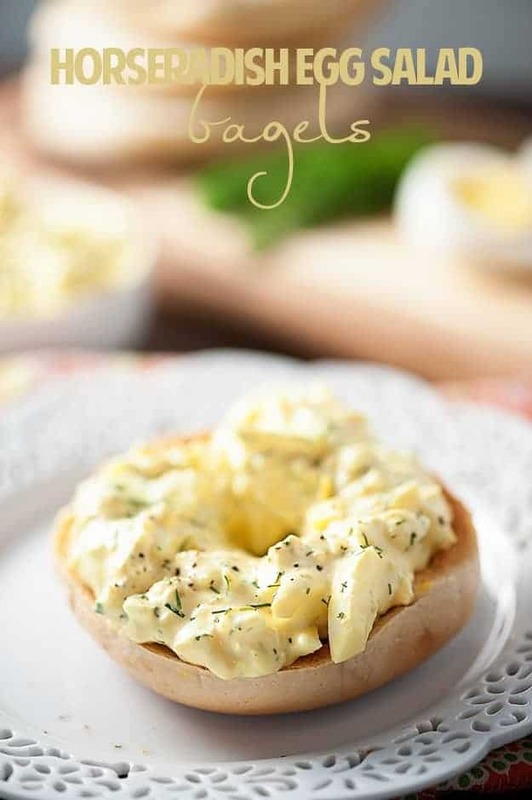 This is the best egg salad recipe you’ll ever try! I mean, how could it not be? My recipe for egg salad is full of cheese and bacon. More of my easy lunch favorites include bacon lo mein, baked chicken legs, and ham and bean soup. So, whether you’re living in the middle of nowhere like me, with no place to go for lunch or a long drive to a grocery store, or you really love egg salad (also like me) this egg salad recipe is the one for you! You have to give it a try and let me know what you think! It’s so darn good! I also have a horseradish egg salad that’s really good too! We serve it on bagels for a fun twist, but it’s really good in a sandwich. And, true story, I eat low carb a lot of the time. That means no bread. I eat this egg salad with a fork and have no regrets. It’s really good in a lettuce wrap as well! Give this one a try and report back. Curious to hear what you think. 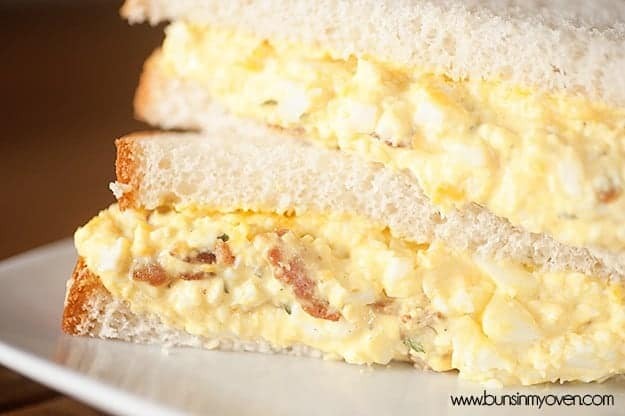 This egg salad recipe is packed with flavor from the bacon and cheddar! Be sure to adjust salt as needed in this recipe, as some bacon and cheddar are quite salty already. Add the eggs to a medium sized pot and fill with water to 1 inch above the eggs. Bring the water to a boil over medium heat. Remove from the heat, cover with a lid, and let sit for 15 minutes. Run the eggs under cold water or place them in an ice bath until cold. While the eggs are cooling, chop the bacon into bite sized pieces and fry until crisp over medium heat. Drain the fat and set aside the bacon. Peel the eggs and mash them finely with a fork. Add the mayonnaise, mustard, vinegar, parsley, salt, and pepper and stir to combine. Stir in the bacon and cheddar. Serve as a dip with crackers or between bread as a sandwich. 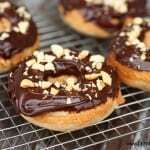 I modified it based on my tastes and it is deelish! Used celery seed in place of parsley, added smoked paprika to taste, only added salt AFTER I tasted it with all other ingredients and only added enough to suite my tastes. 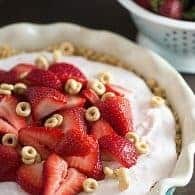 “Also, I omit the cheese d/t dairy allergies, but I have made it with vegan sharp cheese and even my friends liked it. . 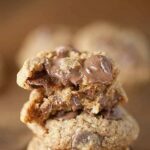 Thanks for this recipe, it’s a keeper! Comments from others were helpful including salt to taste given other ingredients. Also, I may ty varying based on comments: chipotle mayo while omitting mustard and vinegar; fresh dill; pickles; chili powder.